This Sunday, May 21st, was Prison Ministry Awareness Sunday. Thank you to everyone who has been supporting St. John’s letter writing ministry. The recipients of your letters continue to emphasis what a blessing it is to hear from people, and to share Orthodoxy with them. This is a small way we can follow through on the directive in Matthew 25: 36: I was naked and you clothed me, I was sick and you visited me, I was in prison and you came to me. Beloved Brothers and Sisters in Christ: CHRIST IS RISEN! 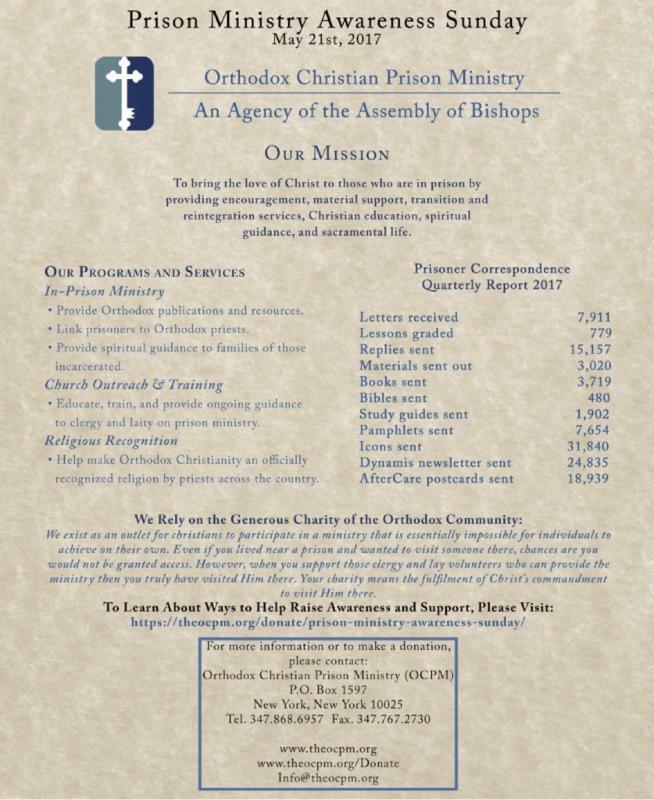 The Hierarchs of The Assembly of Canonical Orthodox Bishops of the United States of America have approved the sixth Sunday of Pascha, Sunday, May 21st of this year, to be Prison Ministry Awareness Sunday in all Orthodox parishes of North America. “Don’t neglect your brother in his distress while you decorate His House. Your brother is more truly His temple than any Church building” (St. John Chrysostom, On Matthew: Homily 50.4). We who do not live in the darkness of a prison or jail cannot truly comprehend the incredible distress men and women prisoners live with each and every day. OCPM needs all our help to bring the love and light of Christ to these precious souls. 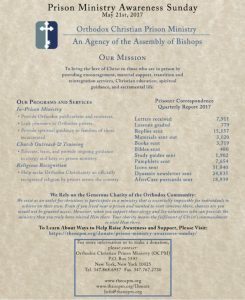 The Orthodox Church, through OCPM, offers both hope and healing to those living in such distress.